Icky-poo! Smudges and smears, fingers and grime on our beautiful touchscreen devices. What to do? You don't want to just wipe them with your shirtsleeve, or put them in the washer. There are nice microfiber cloths for cleaning lenses, but the Toddy Gear Smart Cloth line goes a couple steps further. One side is a more coarse plush microfiber material to attack the grime, and the other is a smooth patterned silk microfiber for the final buffing. Plus, the Toddy cloths have an antimicrobial coating to protect you and the cloth from the spread of those icky germs and bacteria. They're also machine washable. These are available in a variety of vibrant designs and patterns, with 5x7" cloths for $9.99, and 9x9 for $14.99. See my article on Portable Accessories 2012 for more on portable audio, portable power, and cases. The Apple iPad is a wonderful tool -- Just turn it on and off you go. But sometimes a full-size tablet can be tricky to get comfortable with, when you are leaning it on your legs, or trying to prop it up on a table. You can try various supports or stands, but sometimes the simplest solution also can be the most elegant. In this case, the simple answer is the new Wrapsol Non-slip Grip Pad, an elongated oval of gripping material that you can attach to the back of your iPad for a more secure hold. The micro-textured material then holds your tablet in place, so it won't slip on your legs, and stays in place when positioned on slanted surfaces. The Grip Pad is $14.95 for the iPad and other large tablets (8.25 x 3.75 inches), or you can trim it to fit other devices. See my article on Portable Accessories 2012 for more on portable audio, portable power, cases, and other goodies. The good news is that most of our portable gadgets now use USB connectors for both data connections and charging, which means we don't need to worry about keeping track of device-specific cables and connectors. But that still leaves us with three connectors to carry around -- microUSB, typically used for small devices including USB headsets and Android phones, miniUSB, typically used for slightly larger devices such as digital cameras and external batteries, and, of course, the Apple dock connector for iPods, iPads, and iPhones. 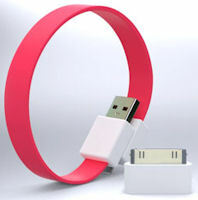 Or you can use just one cable, the Qmadix 3-in-1 USB Retractable Charging/Sync Cable. 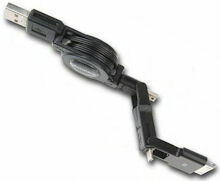 This is a USB cable at one end, with three interlocking connectors at the other: miniUSB, microUSB, and Apple. The pieces all nest together to bring power out to the Apple connector, or they can unplug and swivel to the side to access the micro or mini USB connectors. As a bonus, the cable also is retractable for storage, or extend it to the full 2 1/3 feet as needed to charge or sync your device. So if you find yourself with managing or carrying too many cables, the Qmadix 3-in-1 Cable is a nice answer to simplify the problem. It's available for around $24. See my Portable Accessories 2012 article for more on portable storage, audio, power, cases, imaging, and other accessories. You may think of USB cables as functional and not fashion, but the Mohzy Loop USB Cable may change your mind. The cables are flat and come in a variety of bright colors and patterns. The flat design is easier to carry and store, and doesn't tangle. The ends are magnetic, so they snap together so you can clip it on a bag or wear it as a wristband. Or you can use the cable to clip papers up on your cubicle or fridge. The base cable connects USB to microUSB so you can use it with smartphones, Bluetooth headsets, and other devices. Mohzy also includes a microUSB to Apple adapter so you use it with your iPhone, iPod, and iPad devices. The Mohzy Loop is a clever approach for a easily portable cable. It's available by international order for around $12. Between this and the Qmadix 3-in-1 Cable (see previous post), you can see the broad range of creative ideas even for basic cables. Entries posted to Manifest Tech Blog in February 2012, listed from oldest to newest.